We are who we are, because they were who they were! I’ve been wanting to start production on this handmade dinnerware for quite some time now, but haven’t been able to test the glazes yet, and now that we’re moving…I guess it will have to wait a little bit longer. I am the granddaughter of Portuguese Immigrants! I’ve been fascinated by my ancestors ever since I was very little. Every time I was at my grandparents house, I’d ask my grandmother. “Can I go see the pictures?” I knew she would let me, but I would ask every single time. As soon as she said “Yes,” I’d go into the guest bedroom, open the cedar hope chest, and gently pick up some of the old photos. Then I’d sit on the bed and stare at the people I never met before, and wonder who they were, and wished I could have met them. After a while, I’d run into the living room with a picture or two…so my grandmother could tell me the stories again. I loved to hear them, it didn’t matter how many times I heard them. The time I spent with my grandmother was very special to me. I was a very lucky girl to have such wonderful grandparents! 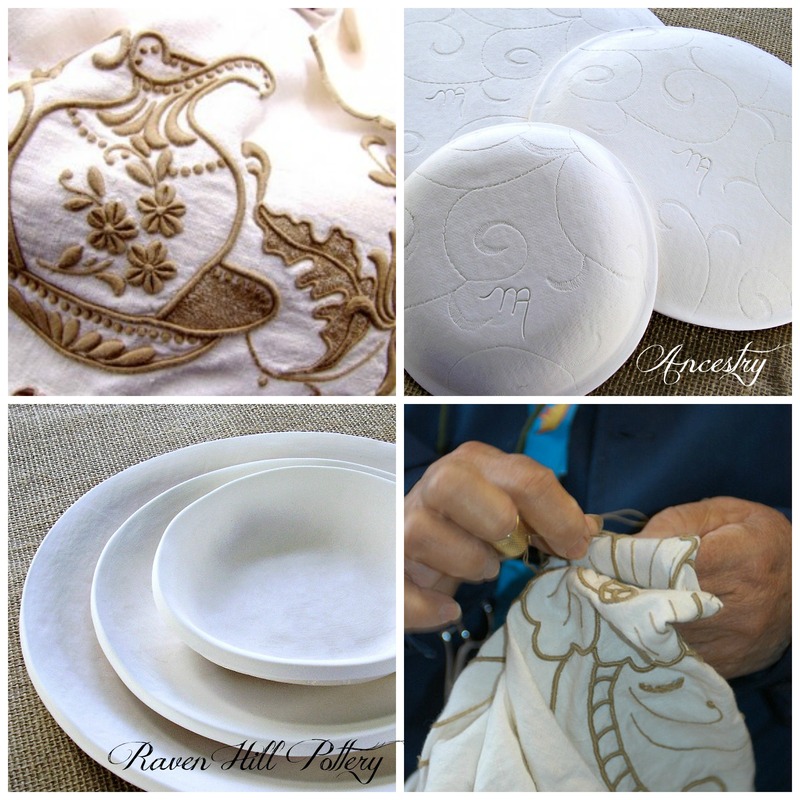 I decided to call this handmade dinnerware “Ancestry” because the design reminds me of Portuguese embroidery. It’s my way of honoring my heritage, my ancestors, my wonderful grandparents. I am bound to them, though I cannot look into their eyes or hear their voices. I honor their history. I cherish their lives. I will tell their story. I will remember them. 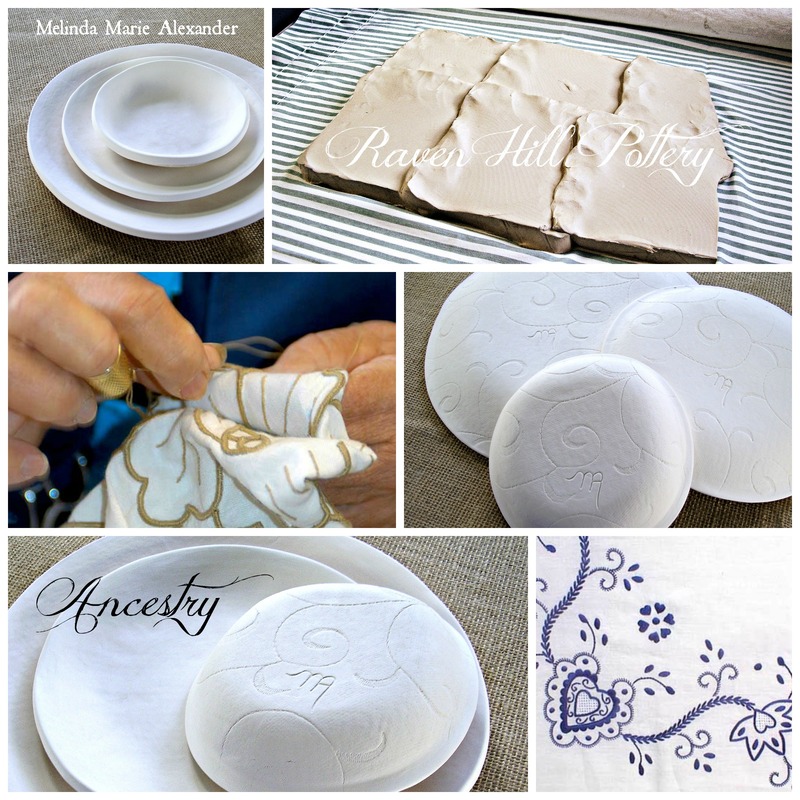 This entry was posted in Uncategorized and tagged ancestry, artist, ceramics, clay, designer, Etsy, facebook, handmade, handmade bowls, handmade dinnerware, handmade plates, handmade trays, home decor, Melinda Marie Alexander, New Bedford, photographer, photography, photos, pinterest, plates, potter, pottery, Raven Hill Pottery, ravenhillpottery.etsy.com, stoneware plates, tabletop, texture, textured plates, twitter, wordpress, workshop, writer by ravenhillpottery. Bookmark the permalink. I am fascinated with ancestry, and yet haven’t really made much effort to look into mine. I think the fact that one of my relatives says there is a major dead end not too many generations back has stopped me from bothering to try. Is this your A post for the A to Z Challenge, If so, thanks for participating!